Long ago, a Bishop named Anselm (1033-1109) said: "Without God's Son, nothing could exist; without Mary's Son, nothing could be redeemed". This is a fitting quote for the Feast of the Annunciation of the Blessed Virgin Mary. We celebrate the birth of Christ on 25th of December; it is only natural to celebrate the Annunciation nine months earlier, on 25 March. 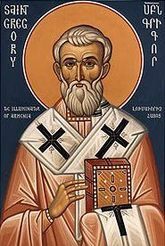 Today is March 23rd, the feast of St. Gregory the Illuminator, called the Apostle to Armenia. Armenia was a small kingdom between the powerful empires of Rome and Persia (Parthia), and both of them fought wars to control it. Gregory was born there about 257. When he was still an infant, his father assassinated the King of Parthia, Gregory could no longer live there, so friends of his family took him away for protection to Caesarea in Cappadocia. His education in Caesarea was provided by a Christian nobleman named Euthalius. When Gregory grew up , his thoughts returned to his native land, and he wanted to introduce the Christian teaching there. Today we remember Joseph, the Guardian of Jesus, and Mary. Their isn't much in the Scriptures about him, Matthew and Luke's have a few details. The other references to him are just passing, However we can know many things about Joseph as we honor him today. First of all, the realization that God, Himself entrusted to Joseph, the safekeeping of the Eternal Word, made Man by the power of the Holy Spirit in the womb of the Virgin Mary. That alone speaks volumes about the his character. You can see inferences in later stories about Jesus when people who knew the family say over and over "Is this not the son of Joseph?" Clearly, Joesph loved and cared for Jesus as if he was his own, and is an example for all Dads and step Dads everywhere. As Brad Paisley's song says, "I hope I'm at least half the dad That he didn't have to be". Joesph didn't HAVE to follow this path, he submitted to God's calling. We know Joseph was man of profound faith, obedient to God, no matter what was asked of him. When the angel told Joseph how the Child came to be that Mary was carrying, Joseph immediately and without question or concern for gossip, took Mary as his wife. How many men would do that? Later when the Lord sent the angel again to warn Joseph that his family was in danger, he left all he had behind, his family and friends, and property, and fled to a strange country with his young wife and their baby Son. Patiently he waited in Egypt until the angel told him it was safe to go back. Most profoundly, however, we have to realize that when Jesus speaks to us of a loving Father in heaven, He was using a word that he had first learned as a young boy to apply to Joseph, the man who guided His early life. That is how Patrick changed the world, because very soon the Roman Empire fell in the West, and learning and knowledge were snuffed out. That is, all but in Ireland, where the newly literate Monks carefully recorded and transmitted what information they could throughout the dark ages. If not for the Irish Monks, the Western world would have lost a great deal of its knowledge and literary heritage. We in the Anglican Communion remember him also for sending a party of missionaries headed by Augustine of Canterbury (not to be confused with the more famous Augustine of Hippo) to preach the Gospel to the pagan Anglo-Saxon tribes lived in England and, who had conquered or displaced the Celtic Christians previously living there. Gregory took an active interest in their work, writing numerous letters both to Augustine and his monks and to their English converts. To this day the See of Canterbury is the Senior Bishopric of all the Anglican Churches.He is also the Patron of the Order to which I am a Postulant. I can remember when I first moved to Tulsa in 1979 a Christian radio station that used to play a song about "Forty brave soldiers for Jesus". Some of you Tulsa readers remember this song also, I suspect! I thought it was kind of a odd song, and didn't pay much attention to it until years later when I learned that it was based on real history of forty men who laid down their lives for the Lord. It was in the year 320 when Valerius Licinius was the Emperor of the eastern part of the Roman Empire, and Constantine was over the west. Constantine had issued the edict of Milan in 313 giving for the first time in it's history, a bit of toleration for Christianity. Emperor Licinius was pressured to go along, but did not approve of this law, and remained a pagan. The two made an alliance (cemented by the marriage of Licinius to Constantia the sister of Constantine), but Licnius broke the alliance and made a new attempt to suppress Christianity. He ordered his soldiers to repudiate the edict of Milan on pain of death. Though we are not all called to the trial of martyrdom, we are all bound daily to fight, and to conquer too. Our Baptismal Vows call us to multiplied victories; over our selves and those spiritual enemies we encounter in our lives - lack of meekness, patience, humility, forbearance. Attaining these we will surely render our triumph complete, and attain to the crown of bliss. O Almighty God, by Whose grace and power Your holy martyrs of Sebaste triumphed over suffering and were faithful even unto death: Grant us, who now remember them with thanksgiving, to be so faithful in our witness to You in this world, that we may receive with them the crown of life; through Jesus Christ our Lord, Who lives and reigns with You and the Holy Spirit, one God, for ever and ever. Amen. 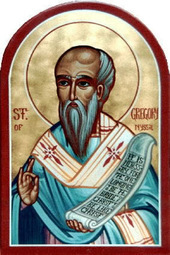 Gregory of Nyssa was one of three men known as the Cappadocian Fathers. They were a major force in the defeat of the Arian heresy by Athanasius at the Council of Constantinople in 381. Christianity would have been very different, had Orthodoxy not prevailed through the talents of these men, with the guidance and assistance of the Holy Spirit. The other two were his brother, Basil the Great, and Basil's best friend Gregory of Nazianzus. Gregory of Nyssa appeared to have been born in Caesarea, the capital of Cappadocia, in the middle part of what is now Turkey, around 334. He was the younger brother of Basil the Great, of Macrina, Peter of Sebastea, Naucratios, and (according to one ambiguously worded document) Dios of Antioch. This was quite a family! While he was young, Gregory was at best a lukewarm Christian. 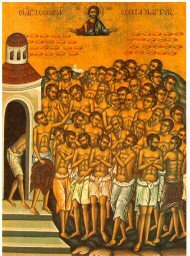 However, when he was twenty, some of the relics of the Forty Martyrs of Sebaste were transferred to a chapel near his home, and their presence made a deep impression on him, confronting him with the fact that to acknowledge God at all is to acknowledge His right to demand a total commitment. That is something that is very difficult in any time period, in any culture, yet I feel it is the core of the Gospel message Jesus preached. Gregory’s brother Basil had become Metropolitan (Archbishop) of Caesarea and was trying to strengthen the anti-Arian part of the Church through the appointment of Orthodox bishops. He made his brother, Gregory bishop of the neighboring Cappadocian town of Nyssa, Lower Armenia, in 372. Metropolitan Basil was in a struggle with the Arian Emperor Valens, who was trying to stamp out the Orthodox understanding of the deity of Christ. 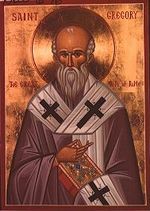 Basil desperately needed the votes and support of Athanasian (Orthodox) bishops, and he maneuvered his friend Gregory into the bishopric of Sasima, also (neither one wanted to be a bishop, neither was suited to be a bishop, and both were furious with Basil). Gregory did not get along well with his flock, as they were infested with Arianism. Gregory, a theologian and mystic, a man of learning, was not equal to the practical demands of the bishopric. The Arians had Emperor Valens depose Gregory in 376, so he spent several years in exile. For several years until the death of Emperor Valens, (the end of the persecution) Gregory lead an uncertain, wandering life, but returned from exile in 378, when Emperor Gratian restored him to his see. In 379, he attended the Council of Antioch, which denounced the Meletian heresy, and was sent by that council to Palestine and Arabia to combat heresy there. After Basil died, Gregory started writing sermons and treatises on theology and philosophy. 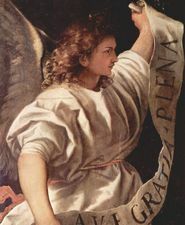 In his approach to the Scriptures, he was heavily influenced by Origen, and his writings on the Trinity and the Incarnation build on and develop insights found in the writings of his brother Basil. But he is chiefly remembered as a writer on the spiritual life, on the contemplation of God, not only in private prayer and meditation, but also in corporate worship and in the sacramental life of the Church. In the year 381, he participated in the second Ecumenical Council at Constantinople, where he stood out as an authoritative theologian. He refuted Arianism and eloquently reaffirmed the decrees of the Council of Nicaea. The council called him, "Father of the Fathers" because he was widely venerated as the great pillar of orthodoxy and the great opponent of Arianism. This man helped make our understanding of Christ, what we know it to be today. 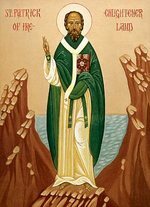 Almighty God, Who have revealed to Your Church Your eternal Being of glorious majesty and perfect love as one God in Trinity of Persons: Give us grace that, like Your bishop Gregory of Nyssa, we may continue steadfast in the confession of this faith, and constant in our worship of You, Father, Son, and Holy Spirit, Who live and reign for ever and ever. Amen. I simply can not understand how such a thing could happen, but it has. That is the thing with this fallen world, things that should not happen, do. But in all the darkness, I still see the Light of Christ. 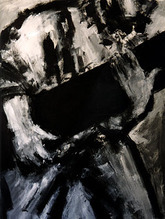 From their website: On Sunday, March 8, 2009, a little after our 8:15 service began, a man entered First Baptist Church and fired several gunshots at our Senior Pastor, Dr. Fred Winters. Pastor Winters was taken to the hospital but died of his wounds. I offer my prayers for the repose of the soul of Rev. Winters, and for his community and family. We often hear the phrase "carry your cross" or "we all have a cross to bear" but today, I would like to consider the one human who can literally say he carried the Cross. During Lent, many of us attend a service called the Stations of the Cross, were we re-enact the walk of Christ from the Condemnation of Pilate to the cold darkness of the Tomb. The fifth station is where we meet a man called Simon. As Jesus was staggering under the load, shouldering His cross out of Jerusalem to the place of execution, there was a guy in the crowd coming in from a place called Cyrene. His name was Simon. The Roman soldiers picked him, apparently at random, out of what was probably a large group of people watching the executions. Why? Was he taller? Did he catch the eye of the Centurion because he looked strong enough to carry the load with out further delay? We will never know in this world. We do know that the Romans had a legal right of a soldier to require a provincial to carry his gear one mile for him, and that is probably the law used in this case. But did Simon just go his on way unaffected? No. Somehow, Jesus in the short time He had with Simon touched him in some profound way that forever changed him. We know that the Gospeler Mark tells us that Simon was "the father of Alexander and Rufus" without further explanation, apparently taking it for granted that his readers would all know who Rufus and Alexander are. About a century later, the Christian writer Papias tells us that Mark originally wrote his Gospel for the Christian community in Rome. It appears that Alexander and Rufus were well known to, and probably part of, the Christian community in Rome. Also in the Acts of the Apostles, we hear that some "men of Cyrene" are preaching the Gospel in Antioch. Was Simon one of them? We don't know for certain, but it does seem that Simon was profoundly affected by Jesus and was converted on that day. He learned to continue to carry the Cross of Christ, and his children followed the Lord after him. The question is, how does carrying each other's burdens convert us?